THE TOP 5 SUNDAY TIMES BESTSELLER, AS FEATURED ON SIMON MAYO'S BBC RADIO 2 BOOK CLUB. The million-selling author of the Lewis trilogy brings murder back to the Outer Hebrides. A man is washed up on a deserted beach on the Hebridean Isle of Harris, barely alive and borderline hypothermic. He has no idea who he is or how he got there. The only clue to his identity is a map tracing a track called the Coffin Road. He does not know where it will lead him, but filled with dread, fear and uncertainty he knows he must follow it. A detective crosses rough Atlantic seas to a remote rock twenty miles west of the Outer Hebrides of Scotland. With a sense of foreboding he steps ashore where three lighthouse keepers disappeared more than a century before - a mystery that remains unsolved. But now there is a new mystery - a man found bludgeoned to death on that same rock, and DS George Gunn must find out who did it and why. A teenage girl lies in her Edinburgh bedroom, desperate to discover the truth about her father's death. Two years after the discovery of the pioneering scientist's suicide note, Karen Fleming still cannot accept that he would wilfully abandon her. And the more she discovers about the nature of his research, the more she suspects that others were behind his disappearance. Coffin Road follows three perilous journeys towards one shocking truth - and the realisation that ignorance can kill us. He is a terrific writer doing something different. 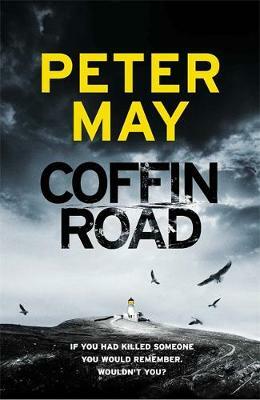 This is the first time I have read Peter May and I will be downloading his previous works. I am so glad to have received Coffin Road, it had me gripped from the first paragraph and I read it in 2 sittings.